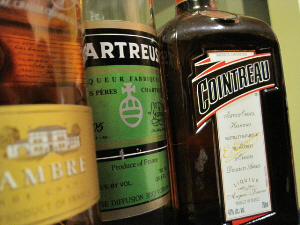 I’d like to be able to claim that I’m writing up several Chartreuse drinks based solely on my enthusiasm for the liqueur. A claim like that would probably be about 80 percent right. I mean, sure, I like the stuff, though I had an adaptation phase for Chartreuse that was almost as long as the one I had for more challenging flavors such as those in Campari or Fernet Branca. With its deep, sonorous potency and a flavor as elaborately rendered and as indecipherable as Sanskrit (for me, anyway), Chartreuse was just way too intense for me to get very close to for a very long time. Eventually, though, after repeat applications of Last Words and Chartreuse Swizzles and the like, I finally came to enjoy a more comfortable relationship with the liqueur. Anyway, that 80 percent accurate thing, and the remaining 20 percent of the equation? Rack that up to my ongoing efforts to push chocolate into respectability in the cocktail world, and the mind-blowingly close yet weird relationship the two flavors have together. I’ll get more into this later (and I’ve already touched on it in the past both in print and online), but many folks in the cocktail world seem to automatically dismiss chocolate as a flavor. I suspect this is due to a few reasons; chocolate is such an easily approachable flavor that it has all those candy connotations we try to avoid with more mature beverages; likewise, the sugary blur of chocolate martinis and things of that ilk have justifiably soured many bartenders and drink geeks against anything remotely related; and finally, we just don’t have good chocolate liqueurs available in the U.S. There have been a few steps in this direction, though; the debut of Bittermens Xocolatl Mole bitters have helped make chocolate more respectable, and the subsequent development of similar bitters from Fee Brothers and from Scrappy’s demonstrate there’s some enthusiasm out there, somewhere. But anyway — back to Chartreuse. I can’t recall when this combo was first introduced to me, but a simple mix of green Chartreuse and hot chocolate apparently has quite a history, if not an accompanying story, especially among the après ski crowd. In cocktails, the pairing of flavors if not strictly speaking the same ingredients hasn’t shown up a lot, at least not until recently, but where it has popped up, the results have largely been devastatingly good. Here’s a cocktail that blew my mind the first time I tried it: the Pago Pago Cocktail. I first came across this on the Tiki+ iPhone app, developed in conjunction with Jeff “Beachbum” Berry. Since then, the drink has appeared in Beachbum Berry Remixed , an essential volume in any serious drinking library (though the drink shouldn’t be confused with the similarly named Pago Pago, which is a completely different critter). 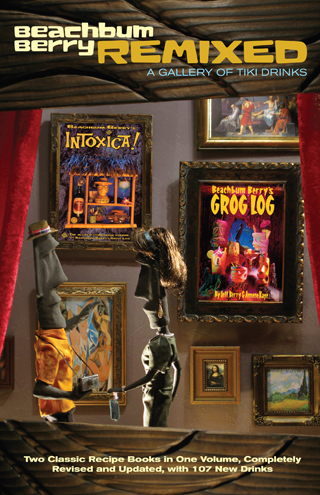 According to Jeff, he came across the Pago Pago Cocktail in a 1940 book called The How and When. Starting with a base of gold Puerto Rican rum — Bacardi 8 works well here, but sometimes I’ll go just slightly richer with something like Cockspur or Mount Gay Eclipse — the drink matches green Chartreuse not only with crème de cacao, but with fresh pineapple as well (NOT pineapple juice — tried it before, and nuh-uh). As seen in drinks such as the Chartreuse Swizzle, pineapple has about as much love for Chartreuse as does chocolate, and the mix of the three (plus a little lime juice) is just an unforgettable combination. I mix this regularly at home, and I recall from one evening at Tales of the Cocktail last summer that there’s a certain love for this drink among the Boston LUPEC crowd; I couldn’t be in better company in my enthusiasm for this drink. Muddle the pineapple in a cocktail shaker with the lime juice and liqueurs. Add the rum and a bunch of ice, and shake well for about 10 seconds. Strain through a fine-mesh strainer into a chilled cocktail glass. Garnish? Hell, does a drink like this need garnish? The Pago Pago Cocktail is what Chartreuse tastes like on a tropical cruise. But it’s almost December, there are Christmas lights going up — without going the simple & traditional Verte Chaud route, what else is there? A couple of years ago, this is the question Jamie Boudreau tackled, and the result was this: the Green Glacier. Taking the Chartreuse / chocolate combo to heart, Jamie placed these ingredients on a rich base of brandy, accented with a little Angostura. This has become a regular winter drink in my house, when I’m in the mood for a little richness and, honestly, a little potency (remember that green Chartreuse clocks in at 120 proof, so with nothing more than liquor and liqueur in the glass, the Green Glacier packs some heat). 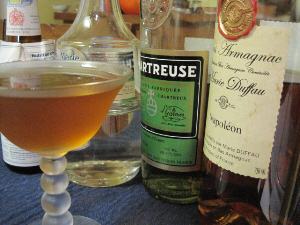 I started by mixing this drink with cognac, but depending on the brand, it can weigh in on the sweet side; recently I’ve gone to using Armagnac, which seems a bit drier and has an earthy flavor that offsets well against the liqueurs. Stir with ice, strain into chilled cocktail glass. Again, no garnish. A very similar drink came across my radar a few months after I first encountered the Green Glacier, but to be honest I didn’t even think about the similarity between the two until just recently. The Prospector was introduced to me by Jay Jones, then a partner and head bartender at Pourhouse in Vancouver, now a consultant with Barjonesing and an organizer for the upcoming Tales of the Cocktail in Vancouver. Jay’s a longtime fixture of Vancouver’s impressive cocktail scene, and I talked to him in the summer of 2009 for an article that later ran in Imbibe. Jay named The Prospector after Gassy Jack Deighton, a prospector and saloonkeeper who built the first bar in what came to become Vancouver’s Gastown neighborhood (also named after him) almost 150 years ago. The drink is nearly identical to the Green Glacier — nearly, in that it prunes the brandy (Jones specifies cognac) back by a half-ounce, and similarly docks the Chartreuse by a quarter-ounce but makes up for the liqueur reduction with a bump in the cacao and a little Cointreau (The Prospector is also served over ice, while the Green Glacier is served up, so call that another difference if you like, and while we’re at it 86 the bitters and give it a lemon twist). But while they look so similar on paper, the drinks are sufficiently different in flavor to merit giving each a try. Where the Green Glacier is rich, heavy and powerful, the Prospector is a bit more relaxed; the Cointreau, even though it’s a liqueur, applies a subtle drying action to the drink, keeping the flavor from sagging, and Cointreau’s resonant orange note also lightens the impact of the Chartreuse, letting it still take center stage at first sip but giving the cacao an opportunity to round out on the finish. Stir ingredients with ice until chilled, about 20 seconds; strain into ice-filled rocks glass; garnish with a big lemon twist. And while I’d only meant to write up three Chartreuse / chocolate drinks that I really enjoy, there’s one more that really should be mentioned: the Brigadier, from San Francisco bartender Neyah White. Neyah gave me this recipe a couple of years ago, while I was working on an article for Imbibe about Cherry Heering. I used another of Neyah’s recipes in the article, but I did put this up on Serious Eats a while back, and I break this out at home sometimes on cold nights; I don’t usually go for sweet, dessert kinds of drinks, but on a nasty night this very simple variation on the hot chocolate-and-Chartreuse combo can be particularly comforting. Mix ingredients in a warmed mug; stir. Ta-da! Anyway, there’s four drinks with Chartreuse and chocolate. Okay, I’ll shut up now. My only experience with Chartreuse was a shot bought for me as an initiation into a Halloween event planning committee. It was meant to terrorize, and it sure as hell did. But these recipes might help me recover from my post traumatic stress and do some experimenting, Thanks for the inspiration! This is an excellent post; I love Chartreuse. Also, I’ve got to say, it was a real treat checking back in after a couple weeks to see your posting kicked into overdrive. Definitely looking forward to the rest of 60/30. 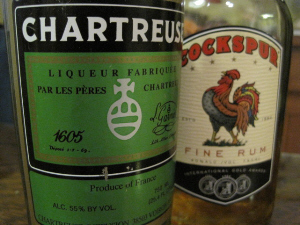 Unlike Fernet (or, years earlier, Guiness), Chartreuse is not a taste I had to acquire – I loved it from the first sip. On the other hand, I’m one of those people that chocoholics can’t relate to. Yeah, it’s a nice dessert flavor (if done subtly), but nothing to obsess over. Anyway … the Prospector I’m drinking now is as overly-sweet as I expected from the ingredients list (even more than an after-dinner drink should be, at least for me). It’s definitely one saved by the Chartreuse. My preference is definitely for the Green Glacier, with its standard Chartreuse presence, muted cacao, and always-tasty brandy’n’bitters base. Rich and complex. I really enjoyed this post having fallen hopelessly in like with green Chartreuse since the first time I tried it. I’m just about to try the Green Glacier, to be followed by The Prospector. The post has inspired me to have a Friday night Charteuse-a-thon. I’m thinking of creating something with Calvados perhaps. Chocolate can work really, really well in cocktails. I made some spiced rum with cacao nibs a while back and really enjoy the dry chocolate flavor it imparts to drinks. Wow this was really interesting and also stunning to me because i just recently posted Pago Pago and a twist of it for my Repeal Day post! The reason i picked that drink for the post was because it contained green chartreuse and pineapple. That the chocolote would go so well with chartreuse was a surprise to me. Luckily we have here an excellent chocolate spirit in Mozart Dry which i used in my twist instead of creme de cacao. Green chartreuse, chocolate and pineapple…mm..its REALLY good. I really want some of the Mozart Dry — had a little taste at Tales (from a sample you brought, I’m assuming?) and quite enjoyed it. We can’t get a quality creme de cacao in the US right now, though I believe Jennifer Colliau (Small Hands Foods) in SF may be planning to change that. Is the Marie Brizard not any good? I was thinking about ordering some, but if it’s not going to be worth it, I’ll just try to make my own and see what comes out. Marie Brizard is probably the best commercially available CdC I’ve found in the U.S., but it’s still not mind-blowing. Until something else comes along, I’ll keep it around, but I’m hoping that a really top-notch CdC comes along soon. Paul, yeah it was the sample i brought. I`ve been trying for a while to get it to the csowg but they are saying they are waiting for export permit issues or something like that. Good you mentioned it, now i can remind them and check the status of today! After i got it its the only chocolate spirit i really like, then again its not a liqueur. Mmm, I agree Chartreuse and Chocolate are a great combo, I used them both in a drink for last month’s MxMo, using Mozart dry and Chartreuse Elixir Végétal. Mozart is fun, I’ve been playing with a bottle I ordered from the UK Whisky Exchange they shipped to me here in NY. I assume I first read about it in one of Tiare’s posts. Think I’m going to use it for tomorrow’s MxMo as well.